There are concise and detailed views of deposits. 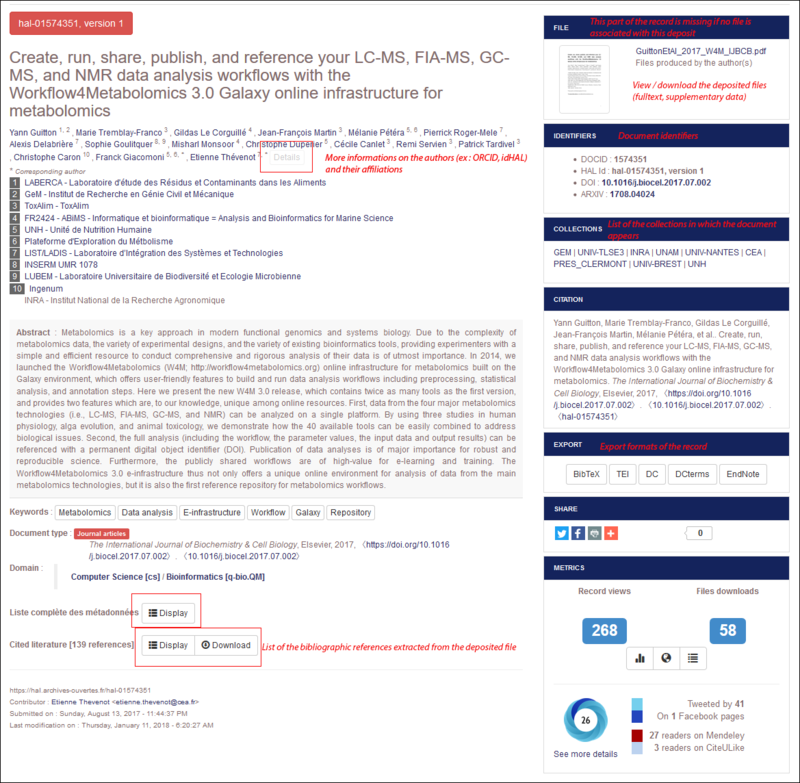 In a detail view, details about the authors and their laboratory can be displayed, and also the complete list of metadata in the record. Identifiers : HAL identifier, DOI, PMID, etc. Sharing : by mail, tweets, social networks, etc. Unlogged user : view the full record and the document full text when available, export the record (in BibTeX | XML | endNote | JSON formats), share it on various media (social networks, mail, etc. ), and view the metric data. Logged on user : “Add to my library” action button”. The system provides for pre-existing shelves for document classification. Users can create a new shelf. Collection manage : stamp or destamp the listed deposit in/from one’s collection. If they manage several collections, users should first select the collection, and next stamp deposits. Deposit owner : Edit the metadata, Add a file, Deposit a new version, Delete (only the record). Portal administrator : Edit the metadata, add a file, Deposit a new version, and Delete (only the record, view Histories.